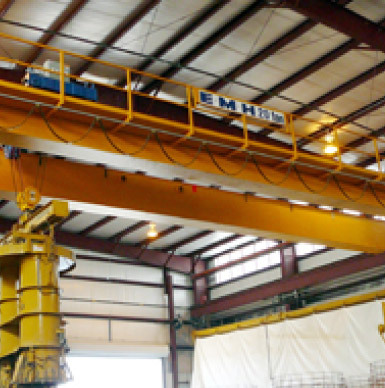 Free Standing Cranes Bring You Flexibility | EMH, Inc. There are many reasons you may need a free standing bridge crane. Most commonly free standing cranes are a sought after crane solution when leasing a building – perhaps you are not able to install a crane per your lease or (morse likely) you are not about to invest in installing an overhead crane in a building you may be leaving soon. Structurally, buildings sometimes won’t support the installation of an overhead/bridge crane (i.e. pre-cast concrete buildings) so the free standing crane is the only option. Additional benefits of free standing cranes are that you can move from place to place (building to building or within the same facility) and shipping is more affordable. EMH’s NOMAD® Free Standing Crane System are a leading solution of free standing cranes which feature runways that work well in pre-cast concrete buildings. The NOMAD® free standing cranes low headroom design maximizes lift when headroom is at a premium.